There are hundreds of bingo sites available online and each of them has different types of welcome bonuses to entice players to register with them. However one of the main concerns of players is not the welcome bonus offered but rather whether the registration process to open an account is lengthy or too complicated. Players prefer to have easy access to the website without too much hassle or filling in never ending forms with irrelevant and sometime personal questions that some might be uncomfortable to divulge. In general when players access a bingo site, they will see a “Join Now”, “Play Now” or “Click Here To Register” tab to register an account, and if they click on it, it will load a registration page where they will require inputting their personal details such as Title, First Name, Last Name, DOB, Country, Currency, Address, Post Code, Phone Numbers, Mother’s Maiden Name, If referred by a friend, Username, Password, Confirm if they are over 18, Confirm if they accept to receive emails, SMS or phone calls. Then players have to tick a box to confirm that they agree to all the terms and condition set by that particular bingo site. However it is strongly recommended that you go thoroughly through all the terms and conditions and understand its content, and if required contact their support team for further clarifications if you have any doubts, instead of falling prey to undesired pitfalls trap regarding the terms and conditions which are usually quite lengthy and written in small fonts. Players are normally advised to register at a bingo site that have already been around for a while as it will be more trustworthy and they can do some research on the internet as well prior to select the desired bingo site they want to register. This will allow them to have a good idea of what other players think of that website in regards to their own experience and if the site has a good payout. If a site does not have a good payout, players will see more negative comments in reviews by individuals and these bingo sites are to be avoided. All bingo sites are regulated by governing bodies more commonly known as “Gambling Commissions” which are independent commissions which regulates the eGambling industry so as to ensure that it is conducted honestly and fairly, remains free from criminal influence and that it does not cause harm to the public at large, individual persons and families. The Gambling Commissions also investigates complaints by aggrieved players. So if you find a bingo site that is not licensed by a gambling commission, the proper decision would be not to register on that site. We have tried to register at a few regulated bingo sites and came up with different layouts of the registration page where most of the time the more or less same questions are asked to be filled in for the registration process and it happened to be a bit lengthy. 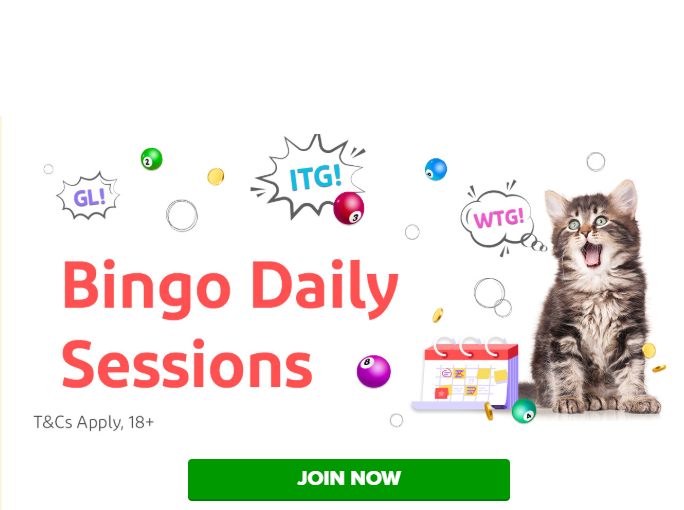 One site that have caught our attention is Kitty Bingo, where we were able to comfortably access the registration page by clicking on Join Now and within a few clicks we had filled in the registration page which was broken down in 3 easy steps in a single page. The same registration process was also found to be available at its sister site; Lucky Pants Bingo, where we were able to join within a minute and where we were not required to provide any irrelevant information. Once the “submit” button was clicked we were welcomed to the site, and we were not asked to provide any credit card details upon registration. Then we made a deposit on this bingo site. The Cashier could easily be accessed from the main page, bingo lobby or any bingo rooms, well it was accessible everywhere. On clicking the cashier button we were taken to the cashier display which is provided by Daub Games and we had quite a few deposits methods in front of us which were to our convenience. The Deposit methods available were Master Card, Maestro, Visa Debit or Credit Cards, Neteller and PayPal. We decided to enter our credit card and CVN details so as to register a payment method before making a deposit of £10. This process as well was uncomplicated and in the blink of an eye, we had £10 in our account with a massive match bonus of 200% bingo bonus + 100 free spins. In general, most bingo sites offer an array of different deposit methods with the main ones being Credit Cards and Debit Cards, Neteller, PayPal and Paysafecard. Most players prefer to use Credit Cards as the deposit method, however, there are also a large number of players who prefer to deposit via Neteller, which is an EWallet where players can move money online in a fast, simple and secure way. PayPal is also one of the safest ways to deposit on a bingo site as it allows players to pay in any way they prefer, without sharing financial information whereas lets you pay online simply, safely and quickly.